In many situations it’s not feasible to install a solar power system due to space, shading, or the simple fact that you need to be mobile. In this situation a mobile system could be an ideal solution. A mobile solar power system is generally a trailer-mounted solar power generator that can be used on any work-site where diesel or other fueled generators are being used. They are cleaner, economical, absolutely silent, and eliminate the need to carry diesel or gasoline fuel. 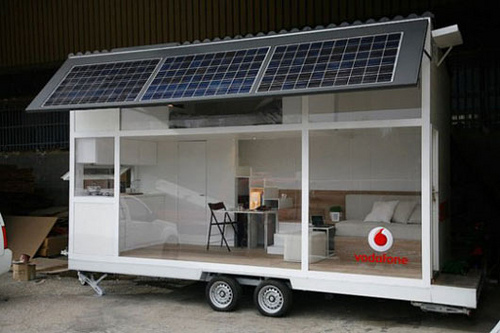 A mobile solar power system is a self contained unit without any need to go for any extensive assembly or wiring. You can also generate electricity for a mobile home or boat by using a roof-mounted solar power system–a case of truly mobile solar power. Either type of mobile system produces onsite electricity for immediate energy consumption or stored energy for later use through a backup battery system. These generation units can also be tied to a fossil-fuel generator for added power security. Mobile solar power systems are a reliable and economical alternative to the power generators that work on diesel or gasoline. While they aren’t cheap–often priced similar to an installed solar power system–these mobile solar power systems offer ease of transport and storage. Even if you aren’t mobile, if you’re still using an old, noisy, polluting generator for backup power generation, you should consider a quiet, clean, environmentally friendly mobile solar power system. Like any other solar panel system, the solar panels of mobile solar power system should be facing the sun as much as possible (something you will have to insure yourself). The tilt angle of the solar arrays of mobile solar power system is adjustable to help optimal power generation through all the seasons.